Recently, I've had the chance to view a film put out by Provident Films. They are the folks behind Courageous, October Baby, Fireproof, and Facing the Giants -- all movies my family loved. 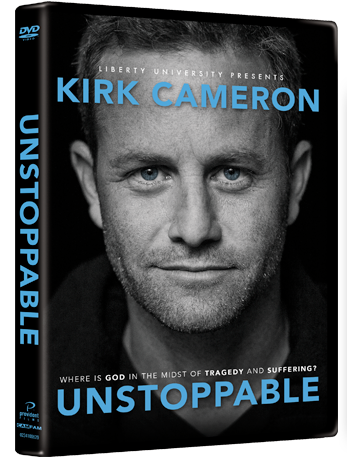 Unstoppable features Kirk Cameron, but unlike the movies mentioned above, this one is more of a documentary, exploring the age-old "Why do bad things happen to good people?" question. This wasn't quite what I expected when I signed on to do this review, but I am used to going with the flow. I ended up watching this on my own, and I will be sharing it with my kids at some point. I wasn't really sure I wanted to be watching this. I mean, I've enjoyed Cameron's roles in other things I've watched recently, but the topic just sounded so depressing. Why does a 15-year-old fight cancer for ten years, and then die and leave behind a family who is forever missing a member? Then I started thinking about the Grief Class happening at my church right now, and some of the video I've seen from that. Or I think about life when I was in 9th grade, with a huge house fire and then my mother battling cancer. I spent a couple of years reading everything I could find -- and I mean everything -- about bad things and good people, about positive thinking, about making sense of all the yuck in the world. I tried to find answers in my church. I tried to find answers from my friends. I tried to find answers from my teachers. I never really found anything. At least not back then. It was nearly a decade before I managed to overcome the nonsense messages I did hear at the time. Watching Unstoppable and trying to see it through those 15-year-old eyes, I really do think this would have really hit a home run for me. Cameron lays it out -- bad things happen. We can't fix them. Does this interest you? I have one to give away! I think this film can be used as a wonderful teaching tool in our homeschool. Bad things happen..we all need a course in learning to biblically deal with bad things. I think the thoughts brought forth in this movie are great starters for deeper discussions on the topic. Thanks for posting your thoughts! I like that it is a wonderful addition to a Christian Library...We need more Bible based movies!